With the summer time just around the corner, it might be the time to give your poolside area a facelift. The coming of the warmer days would bring in more opportunity to spend time outdoors along with the perfect temperature for a swim. The tips below might be useful in achieving an outdoor area makeover. It might seem simple to plant flowers and trees around an area but the truth is that a certain harmony and color combination would need to be respected. Choosing just about any plant will not do. For instance, to create a tropical look around the poolside, plants such as palms and bird of paradise can be used. For a more modern and sharp look, cacti of different shapes and height can be planted. All weather wicker patio furniture made out of resins are great for the outdoors. 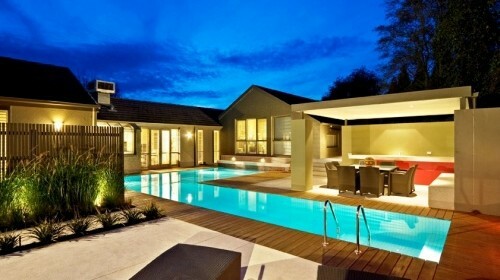 They also convey a modern and elegant look to the poolside area. These types of furniture have the benefit of being very resistant to the element and other factors such as the pool water. These type of furniture thrive in humid environments. You could simply offer a facelift to your poolside just by going for a change in cushions. Outdoor furniture cushions are better chosen in durable and fast-drying materials as they would be in a highly humid place. Vibrant colors such as turquoise or yellow are great for the poolside. However, colors such as white will yield a timeless elegance. Wicker Paradise specializes in wicker and resin patio furniture that are resistant to humidity and sunlight.